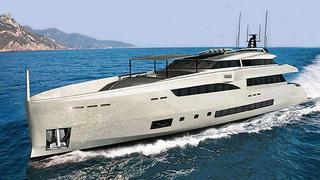 News just in from Camper & Nicholsons that David Seal has signed the second 45m Wider 150 superyacht for sale. Currently under construction with the Italian yard Wider Yachts, she showcases revolutionary design from Tilli Antonelli and his experienced team of designers and engineers. Her distinctive exterior lines are the work of Fulvio Di Simoni, who has combined the classic superyacht styling with a sleek and modern feel. The Wider 150 is powered by a hybrid diesel/electric propulsion system, which allows it to reduce energy consumption when high speeds are not required. It has a range of about eight hours and 56 miles when running on the electric engines, powered by batteries only, even with all on board appliances in use. If diesel and electric are used together, the yacht can reach a top speed of more than 20 knots. The 150’s aluminium construction and semi-planing hull also help to minimise drag, optimise speed and thereby reduce the amount of fuel required to reach a desired speed. The concept features four guest cabins, four crew cabins, and a master cabin with panoramic views on the main deck. Layout and furnishings can be tailored to clients’ needs.